TheBlueGuerilla: EXCLUSIVE: Tory MP Liam Fox Brings Down the House at Parliament Street Birthday. 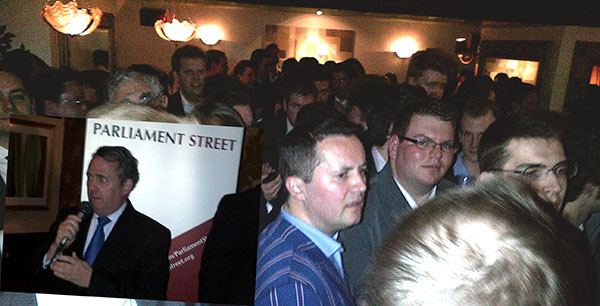 EXCLUSIVE: Tory MP Liam Fox Brings Down the House at Parliament Street Birthday. Tory MP Dr Liam Fox last night buoyed Tory ranks with an uplifting speech for Conservatism and denounced the shirking policies of the Labour Party at Walkers of Whitehall, London - At arguably the UK's most influential think tank, Parliament Street anniversary bash. The biggest cheer of the night came when former Secretary of State for Defence Dr Fox leathered former Tory members whom were present at Walkers for going on a "Short fishing expedition to UKIP", tbg can reveal. Tory party girl jasmine Rahman looked SO HOT yesterday! yeh sweaty, nice, along with all the sweaty tory boys, waving standing on a table trying to get attention and getting down upset when everyone ignored her. @9.10pm Your comments make no sense given - ParlStreet love jasmine and gave her access to the private bar tab after the free bar, she was constantly surrounded by people dying to chat to her, she wasn't sweaty she was actually looking very pretty! At least she didn't turn up in red like a certain other Tory girl, TORYFAIL! jasmine most definitely wasn't ignored, I think the haters on here are clearly jealous of her. Our little jasmine is a gem! Rich Allan really lost his chances with JALLEN. Jasmine was looking HOT On wed! Isn't jasmine now dating Shaun Dias? I thought she's now dating frank manning? It is nice to know that there are people with thousands of pounds spare to put behind the bar, when they are the people responsible for a great swathe of the country having no spare cash at all. Nothing like rubbing salt into the wounds of those you despise.